Looking to buy or upgrade on an electric trolley? Now is the time to do it with PowaKaddy. Beginning today (August 14th) when you purchase any PowaKaddy FW7s or FW7s EBS Lithium Electric Trolley you can claim a golf bag from the manufacturer for free! Combine the benefits of owning your own PowaKaddy Electric Trolley with the incredible free golf bag deal PowaKaddy is offering and you can’t go wrong. This offer won’t be around forever and could save you up to £200 so don’t miss out. Buy any FW7s and get a Dri Edition Bag (Choice of 3 colours) worth £199.99 RRP. Buy any FW7s EBS and get a Premium Bag (Choice of 3 colours) worth £159.99 RRP. Promotion applies to product sold within the UK, CI, IoM and RoI. Offer valid until 11th September 2017 or whilst stock lasts. Offer is eligible with the purchase of Powakaddy FW7s or FE7s EBS Lithium Trolley only. 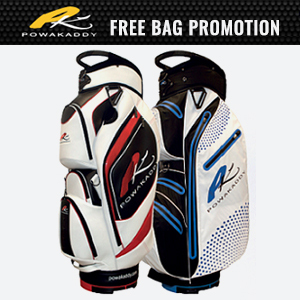 To claim your FREE bag register your details on Powakaddy Website. PowaKaddy will require suitable proof of purchase as well as your full details and serial number of the trolley. Free Bag will be dispatched directly to your address from PowaKaddy within 28 days of registration. Please be aware that you have 30 days from date of purchase to claim your free bag. Full Terms and conditions can be found on Powakaddy Website.